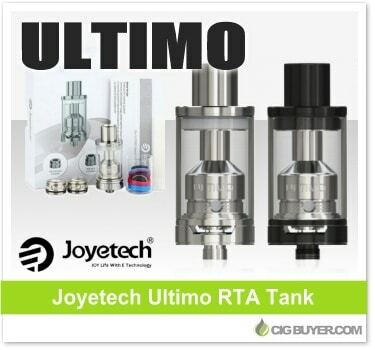 Joyetech has jumped on the ceramic tank bandwagon with the new Joyetech Ultimo Tank. Designed to provide longer-life, more flavor and less dry hits, the Ultimo Tank incorporates Joyetech’s new MG series heads, including a 0.5 ohm ceramic head, along with a 0.5 ohm clapton and 0.25 ohm NotchCoil head. The tank is top-filled, holds 4ml of juice, includes bottom adjustable airflow and is designed to be leak-free with anti-spitback protection. All the parts are fully detachable and washable, and a rebuildable RTA head is also available.